In my prior post, I discussed the latest efforts from The Fifth Sacred Thing Film Project – the group which is working to bring this novel to the screen. 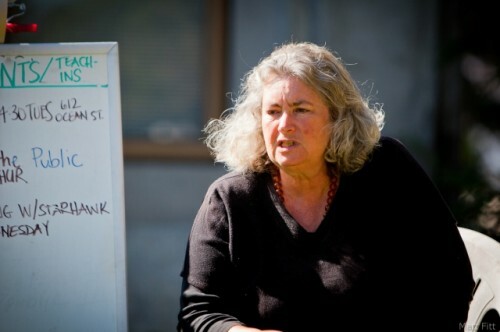 Written by Pagan leader, teacher, and author Starhawk, the book centers around an ecotopian society in the San Francisco Bay Area. Set in the year 2048, the story describes a post-apocalyptic world in which the United States has fractured into several nations, one of which plans to wage war against the Bay Area protagonists. The residents of the city know and utilize this language as part of their recognition and acceptance of diversity. Linguistic differences are honored, not ostracized. Lessons and Council Meetings are always signed as well as spoken, so the Deaf are easily integrated into public life. Madrone spoke, as they all did when addressing the Council, in English augmented with Sign. Finally the last speaker finished and beckoned to Maya. She stepped forward. A young girl, very solemn with the weight of her responsibility, handed her the Talking Stick, an oak staff beautifully carved, beaded, and feathered, carrying in its tip a small microphone. Powerful speakers were hidden in the branches of the four sacred trees that stood at the four quarters around the outskirts of the bowl. On the Signers’ platform, a man stood waiting to interpret as she spoke. All was ready. How and/or why did you make the decision to incorporate American Sign Language and its use, along with the Deaf Community itself, into The Fifth Sacred Thing? In what way(s) do you feel this decision helps to define the story and/or the characters, community, etc.? In The Fifth Sacred Thing, I wanted to explore what the world would look like if it were based on the values I hold and had been advocating for many years, values like justice, ecological balance, and respect for diversity. What would a truly inclusive society be like, one that saw differences not as reasons to hate or discriminate, but as multiple perspectives that enrich us and give us varied ways to look at the world. So, I thought, what if everyone were taught American Sign Language as a matter of course, along with whatever other languages they speak. Not only would that make inclusion for the deaf much easier, but I also believe that a language based on movement and gesture like American Sign Language activates different parts of the brain and would give its speakers a different way of understanding the world. Wouldn’t that society be enriched in so many ways? I have to admit that having that vision in the novel didn’t necessarily immediately translate into awareness of its practical implications today. Our first video for Kickstarter wasn’t captioned until we received some gentle nudging from you! But after you raised our awareness, we now have a policy that all our videos will be captioned. So in that small way, we can start making our vision real! Wouldn’t that society be enriched, indeed. And by working together, we can begin to make such a vision real. Admittedly, there’s a difference between captioning videos and learning sign language. Starhawk would be the first to acknowledge that she herself does not use ASL. Some might say that the lack of such knowledge of the language disqualifies her from writing about it. I beg to differ. 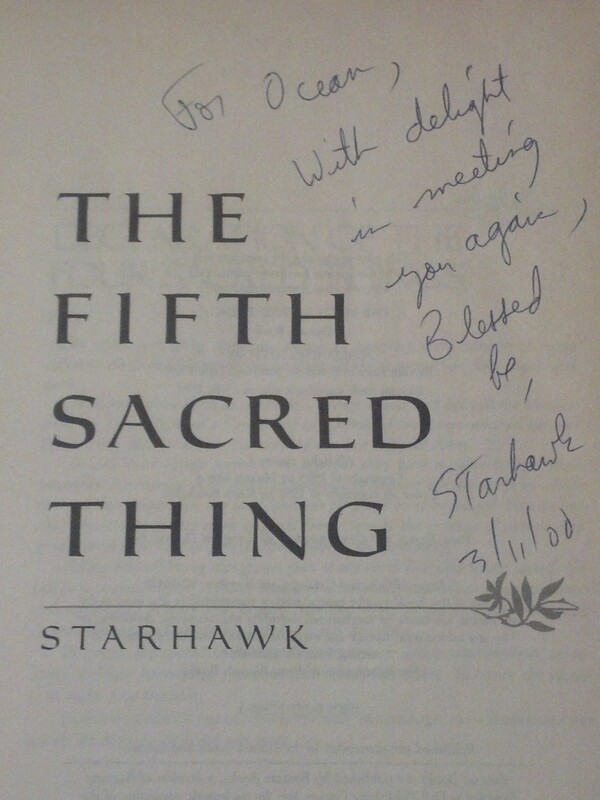 While certainly I would love to see the day when Starhawk and I could hold our own non-verbal conversation, the fact that she recognizes the value of American Sign Language and the rich contribution it can make to our society is worthwhile in its own right. Even more importantly, the fact that she recognizes the value of diversity in all its shapes and forms, and the importance of access and inclusion in sustaining a healthy thriving society is worthwhile in its own right. The fact that she had the courage to create such a vision and write a book about it is worthwhile in its own right. How many of us in the Pagan Community share that same vision? How many of us are willing to caption our videos? How many of us are willing to learn and utilize sign language and teach it to our children? How many of us are willing to include sign language interpreters during our lessons, our meetings, our workshops, our gatherings, our events? How many of us are willing to reach out to members of the Deaf Community – to incorporate them in the planning of such events, to invite them to participate, to encourage them to share their own knowledge and experiences? How many of us are willing to begin translating a vision for tomorrow into practical implications for today? How many of us are willing to believe in The Fifth Sacred Thing?